This post is part of a series on politics in the face of death. For an introduction and links to the other posts, please see here. From the Mediterranean Sea to the US-Mexico border and all the way to the Australian coast line, for some years now states have been deploying military forces to arrest migration and refugee flows. In several countries, the humanitarian approach used to manage the influx of migrants has been increasingly combined with a military one, with some governments waging a war on migrants. In this process, civilians who try to cross political borders are constituted as legitimate targets of military violence—people whose lives do not matter and can be rendered killable. And when life does not matter, surely death too is perceived as inconsequential. The deployment of military means to intercept migrant boats crossing what over the past decade has been transformed into the Mediterranean cemetery, alongside the ongoing disruption of humanitarian operations carried out by rescue workers, have become part of a new common sense. Indeed, the war on migration and the conversion of the civilian migrant into a national security threat manifests itself not only in the strategies, manoeuvres and techniques increasingly adopted by European countries to stop their movement or in the language they use to describe migrants, but also in the way the law of armed conflict is being mobilized against these populations. For many years, international law was used mainly by human rights and humanitarian groups to protect the rights of migrants. When Italy closed all its ports to migrants, asylum seekers and refugees and enforced a military blockade in the Mediterranean, while simultaneously sending those who managed to reach its borders back to its former colony Libya, rights groups vocally criticized the government. Documenting the horrific treatment these migrants have been subjected to after they were forcefully returned to Africa, Amnesty International blamed the Italian government for breaching its obligation of non-refoulement under international law. Similar humanitarian approaches were also considered by a number of European countries when they initially debated how to confront the flow of migrants, but slowly a military logic began shaping policies aimed at “protecting the borders” while eclipsing programs informed by human compassion. International law is still being used as a reference point, but in a very different way than it had been mobilized by human rights and humanitarian groups. In 2015, for instance, as the European Union began developing plans on how to deploy armed forces against migrant boats, it cast migrants who might lose their lives during such military operations as “collateral damage.” As is well known, this legal term is used to describe the unintended death, injury or damage caused to civilians during a military operation, and such “damage” usually transpires as a result of the proximity of civilians to a legitimate military target. Hence, by casting the people attempting to cross the Mediterranean as potential collateral damage, European policy makers not only acknowledged that migrants were susceptible to be killed during the operations, but the policy makers were also clearly intimating that if migrants were to die it would be because they were located near a legitimate military target. In this way, migrant deaths, now deemed collateral damage, could not be imputed to the EU. The way in which governments have mobilized the idea of the human shield can help us gain further insight into the processes through which migrants are cast as targets and their death as collateral. Human shields are, according to international law, civilians or prisoners of war who are deployed to illegally protect a legitimate military target. Whether they do so voluntarily or are forced to do so, the law states that they cannot “render an area immune from attack.” Voluntary shields who die during an attack are responsible for their own death since they put themselves in harm’s way; and when involuntary shields die, those deploying them rather than those killing them are to blame. In armed conflicts, when civilians are framed as shields by state militaries they lose or face the risk of losing the protections bestowed on them by international law. By projecting the legal category of the human shield from the realm of armed conflicts to the war on migrants, the Hungarian government did essentially two things: first, it cast migrants as people who readily use their children as human shields and therefore are committing a war crime; second, it suggested that if the “children shields” are killed, those who use them as shields—rather than the Hungarian security forces—bear responsibility for their death. Yet, Hungary is not alone. In Europe, the Czech Republic has also categorized migrant children as “human shields,” claiming that their parents are using them to facilitate their efforts to enter the continent. Similarly, across the Atlantic, a Tea Party research team has adopted even more intense rhetoric, depicting migrants as insurgents who send their children and wives as a shielding task force deployed to infiltrate the United States. Not surprisingly, the figure of the shield is projected exclusively onto non-white migrants, whose civilian status is delinked from the universal figure of the civilian. The migrants are portrayed as barbaric people who fail to understand the civilized norms promulgated by international law. Not unlike the rebels in Syria, Houthis in Yemen, and Palestinian protestors in Gaza, migrants are depicted as deliberately violating the principle of distinction between combatant and noncombatant, shielding behind “women and children” in order to gain an advantage against state militaries. They are described as perpetrators of a war crime even though the context in which they are apprehended is not one of war. Behind the legal figure of the human shield lies the spectre of the uncivilized colonial subject, which in its contemporary reconfiguration refers to non-state militants fighting in the Middle East and migrants from the global South who are trying to enter the United States and Europe. In this racist neo-colonial discourse, migrants, who are often escaping the horrors of war, are transformed into military targets, people who can be injured or killed with impunity. Indeed, they are portrayed as necro-figures. The projection of the legal figure of the human shield on migrants should accordingly be understood as a form of lawfare that aims not only to justify the deaths of civilians but also to undermine of one of the pillars of international law: the category of civilian. See Neve Gordon and Nicola Perugini, “The Politics of Human Shielding: On the Resignification of Space and the Constitutions of Civilians as Shields in Liberal Wars,” Environment and Planning D: Society and Space 34, no. 1 (2016): 168-187; Nicola Perugini and Neve Gordon, “Distinction and the Ethics of Violence: On the Legal Construction of Liminal Subjects and Spaces,” Antipode. A Radical Journal of Geography 49, no. 5 (2017): 1385–405; and Neve Gordon and Nicola Perugini, “Human Shields, Sovereign Power, and the Evisceration of the Civilian,” American Journal of International Law Unbound Edition, 110 (2016): 329–24. Nicola Perugini is Lecturer in International Relations at the University of Edinburgh and the co-author (with Neve Gordon) of The Human Right to Dominate (OUP 2015). He is currently working on the book Human Shields. A Political and Legal History (with Neve Gordon, UCP forthcoming). Neve Gordon is Professor of International Law at Queen Mary University of London. He is the author of Israel’s Occupation (UCP 2008) and the co-author (with Nicola Perugini) of The Human Right to Dominate (OUP 2015). 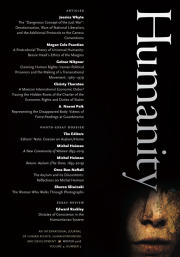 Perugini and Gordon are working on a new book, Human Shields. A Political and Legal History (University of California Press, forthcoming).